I promised the Valley View kid’s I would walk to school with them today, so I was at SWIWSCO for 6:50. They were feeling the Monday morning blues, and many were not dressed and some had just woken up… We should have left at 6:55/7 and I left with the last few at nearly 7:15. I was worried about what might happen if we were late so we set off at a fast pace and occasionally ran. We got to school just after 7:30, which was a great achievement. I stayed to watch Monday morning assembly, as I have never seen it before and to ensure the kid’s’ didn’t get into trouble for arriving late. A ‘bell’ rang (a metal bar on a tree hit with a rock) and they all lined up in front of the senior class rooms. 6 kids came from round a corner, marching, with one leading/being the ‘drill master’. They sang a song which was nearly word-for-word the Scouts promise. The kids at the front then followed the instructions of the ‘drill master’ and went from attention to at ease. They did other things such as a ‘gun salute’ (like soldiers would do) but just acting as if they were holding rifles. They finished by going along the line and tugging at the shoulders of the other 5 to make sure they were standing strong and straight. After this slightly strange routine finished, one of the teachers gave some notices and told them all to read more at home. Assembly ended with the children singing the national anthem, before being dismissed and singing another song whilst marching back to their respective classrooms. I arrived back at the house and talked with the girls, before taking them into town. I showed them where the useful shops were located, before with drawing cash and heading for a drink and Wifi at Fifi’s. After lunch at the house I skyped with Jen. I had discovered that the signal outside was up to 500kb, where as inside it doesn’t exist to around 50kb. In the afternoon I wrote some postcards. Annie came round at just after 5. The four of us were meeting Amber at the Moshi Golf club for an exercise class at 6. I misjudged how far it was and how fast we would, so arrived 15 mins late, but the instructor was also on African time so we didn’t miss much. The class was in a ‘squash court’ in a rickety looking building at the back of the clubhouse complex. The class was what I think is a step/yoga and names of classes I don’t know what they are. I believe being uncoordinated, white and male gives me a severe disadvantage, but I think I did ok and it was good fun for $2.50. The next morning, I walked with Maria and the kids to Valley View. I returned home after introducing her to the teacher of P-Nursery. I read some Swahili and sorted out my room, before returning at 10 to get Maria, as she doesn’t know the way yet. The mountain looked magnificent when I returned home earlier, so I bought my camera back with me, however clouds had appeared by 10. After Melina returned home & we had lunch, we went to Memorial Market to buy some pillows. Godfrey, the oldest boy at SWIWSCO, only had a half day so he came with us as he is the self proclaimed ‘best purchaser at SWIWSCO’. Between the two of us we managed to half the prices we were quoted and get some good pillows that were really quite big; I felt a little stupid walking around with a large pillow under my arm. We also bought some fruit and Godfrey couldn’t believe the prices we were being quoted. On my way home I stopped at a bar to ask what channels they have so I could workout if they would show the England game. As I was trying in Swahili to establish this a fire engine flew past the bar on a dirt road. Around a 100 people ran after it on foot. I decided to also follow. When I arrived at the house fire there were close to 300 people there watching and some helping. The only distinguishing feature of the firemen from the masses were their yellow hard hats… Anybody who could was helping. Luckily nobody was seriously injured. I got lots of comments and stares, not sure if this was because I was a Mzungu or because of the large pillow still tucked under my arm! Melina and I went with the boys to football training at Memorial. We both ran round the pitch and extended area whilst they practised. I added in some sprints and ran nearly 4 miles in total. It was hot but the mountain was in full view, and it was a fantastic backdrop to run to. We got a fair few shouts, but I don’t think anything was malicious. Just after we arrived back we had yet another power cut. Annie was going to join me to watch the game and we were concerned, but decided to try and go anyway as the power cuts can be one house but not the neighbouring house due to how the power lines are setup. The coverage was in typical African time; The coverage started 30 mins late and the TV information for the various games were all mixed up. As the game started about 25 Brits walked in, which felt slightly strange as I’ve only spoken to one other Brit since being here! The game was poor but it was nice to go out and watch it. Sebastine, who is an Uncle who lives in Annie’s house, accompanied Annie and he really enjoyed watching the game – and was more excited than all the Brit’s in the bar. Tuition had not yet finished at Valley view. Jamie was joining Kristine and I at Valley View. I wanted to see a different class today so I went into p6 to observe a lesson. About 20 minutes had passed before I was once again asked to go and teach in p5, as there was no teacher there. Again no textbook too… Jamie was in the lesson as well so between us we strung some maths work together. I was yet again disappointed with my lesson. Ali, one of the SWIWSCO boys, was not behaving very well and in a physical punishment environment I feel a bit lost. To compound matters I had to get really mad with Ben, a pupil in p4 who has friends at SWIWSCO. He has a real chip on his shoulder and pushes it with me at school. He walked past and started shouting into my class room. I was so close to sending him to the staff room. The kids seem to only respond to the cane and I worry if I keep threatening and nothing happens they could start to ignoring my threats – the other teachers would have no hesitation in giving the cane. After a frustrating morning I joined the girls plan and leaving at break. They both needed the internet for various reasons, so we headed into town after lunch. We went to find a new supermarket and bakery that we had been told about by Sophia. They were both brilliant. In Aleem’s (the supermarket), the amount of different brands blew me away. I bought some lovely Tanzanian lime jam. The bakery, Abbas Ali’s, was also fantastic. They were both close to Fifi’s, so we headed there to drink coffee and spend a few hours on the wifi. Town seemed to be a bit of a shock for Jamie. After dinner I got a Facebook message from Reece, who is he captain of Lancaster Ultimate frisbee team for 2013/14 and was the vice captain last year. He carried out an online survey to gain feedback on various aspects of the club for the 2012/13 season. He had sent me the feedback I’d been given. I didn’t think it would make easy reading and it didn’t. I appreciated the constructive criticism but I was quite hurt by some of the comments. Especially as I have a very good idea who wrote them. I gave my all even through some tough personal challenges and comments like ‘not enough experience’, even though I was the second most experienced player on the team, isn’t constructive criticism. I went to SWIWSCO but really wasn’t feeling like doing much, so I headed back to catch the end of the Man City game. I didn’t sleep well so I decided not to go to school in the morning. Pam was working a late shift and didn’t start work till 3. She kindly agreed to show Kristine and I round Memorial market. The market is a 5 min walk away and is nearly all second-hand clothes, bags, shoes and material used at home. I have been once before but the place still takes my breath away. I got some Converse trainers, which have soles that are next to new, for £10/$14.5. Kristine bought a bag for £4/$6. Prices for t-shirts are £1-2 and an Eastpack backpack for £4. Pam left Kristine and I as we continued to walk around the market and soak in the atmosphere. I had to haggle a lot as I would not be given a good price with working for it. Everything needs a really close inspection as it is all 2nd hand, mostly from American charities. There are fantastic bargains to be had. Had a really good session at the internet cafe, trying to arrange a trip to Musoma. Spent a really good afternoon and evening at SWIWSCO. I will be packing my bag well before I leave and heading back to memorial to buy clothes to fill any remaining space! I love the idea of Reece doing a club survey and I really value the feedback. It was great to read the positive things people said. I felt some comments were unjustified and that’s a little more difficult to deal with so far from home. Kristine and I returned to Valley View for what we thought would be the final day of tuition. I went to p5 again to watch a lesson. The Swahili teacher didn’t show up so the English teacher turned up instead for the first half of lesson to review what they had done the previous day. He left early and I decided to do a little bit of math’s with the kids. At the end of an extended break a group of the teachers from Kenya told us they were leaving to go back to Kenya… I was then told by another teacher to go and teach math’s in p5. They had done more fractions work when I was away so I continued this. However the math’s teacher turned up 15 mins late and sat there whilst I finished my questions. Before I had finished he handed out some homework and went away again. 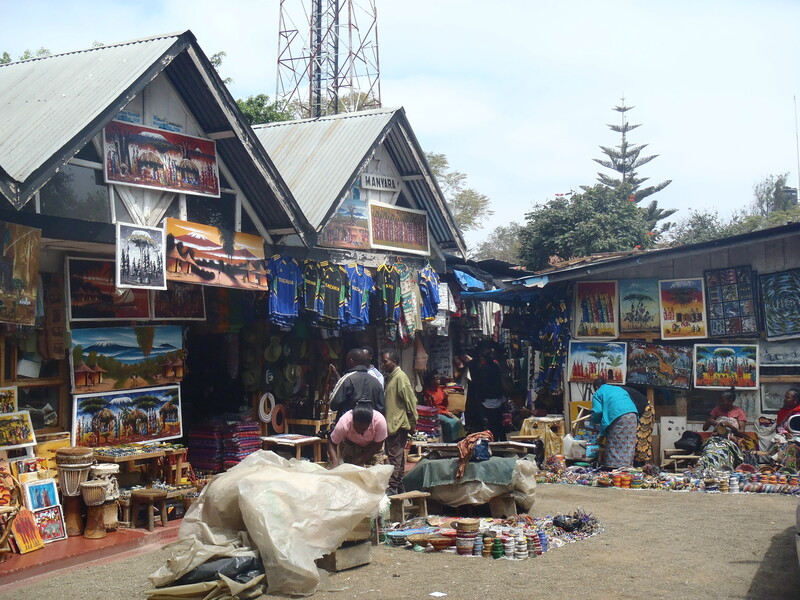 Once again Kristine and I headed to the internet café to research Zanzibar, but this time to actually book our flights and look into our trip. The previous night Barack, an Israeli who had been visiting the orphanage for a day, told me about a much cheaper diving company. We booked our flights and I looked into diving in the north whilst Kristine is looking at going to beaches in the south. Luckily Kristine was there as none of my cards would be accepted on the airlines website! I rushed back to get ready for another session at KCMC. There was not as many people at the session tonight so we didn’t stay as long. I headed into town to meet Kristine and Amber – A Canadian girl who is working at Moshi University. We all went for dinner at Milan’s; Which is a low key vegetarian restaurant. It was great to meet another person who had been in Moshi for some time and to go out for a meal. Kristine and I were up early the next day even though it was a Saturday. 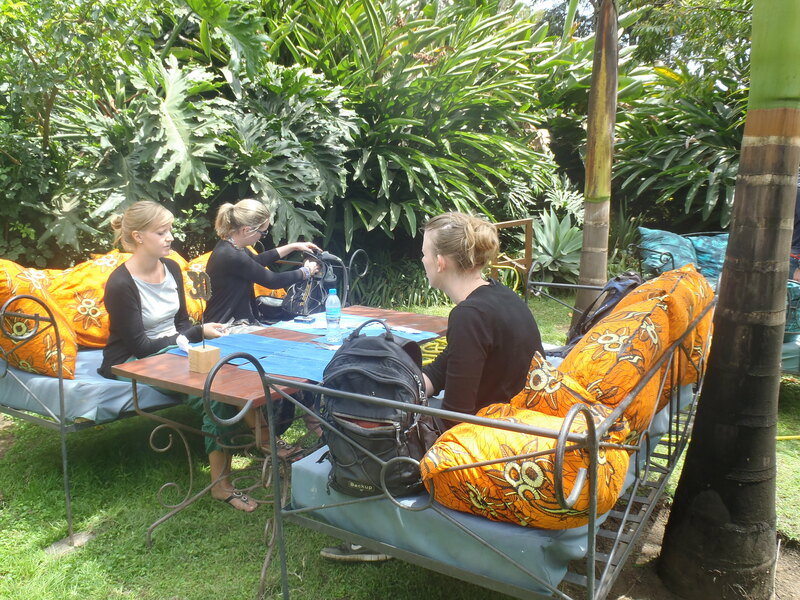 We were meeting Sophia and Nicola (other volunteers who Kristine had also met on another trip) at Moshi bus station to catch a bus to neighboring town Arusha. The bus was only 1.20 and was surprisingly nice; The seats were cushioned (even though mine had no springs on the left side) and it wasn’t too hot or noisy. The bus took just under two hours and we arrived in to a very busy and manic bus station. We were heading to a Maasia market a short walk away. It took some finding and was not what I was expecting. I thought we were heading to a local market (which would sell all kind of animals and fruit) but instead we were in a tourist market. I had great fun walking around and buying a few little things. I had to negotiate furiously for every item. Getting prices down by two or 3 times the original price that we were quoted. There were so many people selling the same thing that if they weren’t giving me a good price I could walk away. Wednesday morning was sad for everybody at SWIWSCO as Jacqui was leaving. She came over and said bye to all the kids and us. Kristine and I walked with all the Valley View kids to school, however we weren’t going to Valley View today but Mount Kilimanjaro school instead. It is a school which is another 15 minutes beyond Valley View that has Primary to A-level classes in it. We went into watch Hassan who is in p6. The school is also a private school but the differences are vast. The building reminded me of my high school Ryburn before we moved buildings. The teaching was also done in English but was a standard which was far nearer to teaching in England. I was really glad that we experienced this different school. It had far more western features about it. It didn’t surprise me that it was ran my an Indian man. After making the long walk home we headed to the internet café to book our trip to Zanzibar. Kristine and I were both surprised how much everything cost. The internet was running so slowly it made it really difficult for us to research. The cost made us both agree to think about even going. This put me in quite a low mood. My low mood was lifted after another trip to KCMC, to train with the Moshi Ultimate Frisbee team. There were far more people attending this week and we had some great games. To top it off the mount came out of the clouds at about 6 and the sun set onto the snow making a spectacular view. On Thursday Kristine and I also went to Mount Kilimanjaro school again. This time to watch p5 as there are two girls from SWIWSCO in that class. We were unlucky that the first lesson was double Kiswahili, so we didn’t know what was going on. The next lesson was English and it was another great lesson. I was really impressed with the kids attitude and the teacher for delivering a fantastic lesson. The head teacher of the primary unit then welcomed us to her office to show us some of the school statistics; They came top in the Moshi area. The walk back felt even longer today. Kristine and I once again headed to the internet to have another look at Zanzibar and I spoke to Jen on Skype afterwards. I popped into to SWIWSCO before again heading to KCMC to meet up with Frank and Riziki – Two members of the Moshi team. Riziki is training to be a teacher and on a Thursday afternoon he has been teaching Ultimate Frisbee to the boarders; most of which are girls. The three of us somehow fit onto one of the Chinese 125cc bikes that Frank owns and headed 20 mins out of Moshi. I am glad Frank is a great driver as I don’t think that the bike would have made it up some of the hills and through the dirt roads without expert skill! We must have looked a funny sight, with me in the middle of the two guys. A lot of people made various comments and hecklers as we drove past. There were a few boys and men that were there during our game. The girls seemed to really enjoy themselves. They have lots to learn, but as long as they were having fun and grasping the general idea that’s what really matters. The pitch was very green, which was a nice change from KCMC. I did only have one contact in, which made things interesting but I also had a fantastic time. I think it was quite a sight to have a young white guy running around playing sport with the pupils. Frank kindly gave me a lift back to Mawazo after the session. After having a fantastic hot shower (curtsey of a large pan of boiled water) I headed over to SWISCO for a few hours. The night was really funny. I spent some time with some of the older kids around the fire and we just spent most of our time laughing at my Swahili and other things. The kids are getting ready later and later. We didn’t set of till after 7:30 so arrived at school just before 8, however lessons didn’t start till nearer 8:30. I was in P5 again to watch maths. The day began with 5 mins of Swahili before the maths teacher arrived and decided that is was time for maths. They were revising fractions. However after 5 mins he handed me the textbook, said “We have a new maths teacher” and left. I continued the lesson and did ok. It’s difficult when all the kids are used to what I would consider hard discipline I’m class. At break Kristine and I walk to a local shop to buy some half cakes and mandazie. Both are small fried break products that are made slightly differently and cost 100ts (4p). The History and Geography teacher came in after class and was confused, wanted to see the kids work from the day before, then left. I decided to do the science lesson I planned. It went well as we had not long to complete the work I had hoped for. I was really pleased with how the day went, I had to speak to the some of the SWIWSCO kids to remind them this wasn’t the orphanage but school, but overall they were great too. After lunch I was flicking channels and to my delight live ashes cricket was on an Indian sports channel we have. Fate was against me however as I only got to see 1 ball before a power cut. Once power had resumed (only 20 mins later) Kristine and I hoped to go to the Internet cafe, but the power outage had knocked it out. There was no Internet but SWIWSCO did have a visitor. Beth has spent some time on the children’s ward at KCMC and wanted to come to see some more kids. We spent a few hours at SWIWSCO with hr kids, who were un characteristically shy for a while. But they stared to resume to their normal selves after a while. It was really nice that Beth could come and visit the orphanage, I think the kids really enjoy new visitors. During Beth’s visit another new volunteer showed up, Sarah. Who is from America but is studying at the same university as Kristine in Cairo. She was exhausted after her flight and a frantic few days before arriving though. We attempted to go to the Internet again but to no avail. I spent the evening doing class questions and home work till late (which is 10 for me here after early morning starts). I wasn’t planning to teach again tomorrow, but just watch. I’m really glad my first full day of teaching went well and I’m really looking forward to doing more teaching during the rest my stay.